In a culture where cesarean section is viewed as simply another way to have a baby, we seldom hear the voices of women whose experiences have not been so easy. 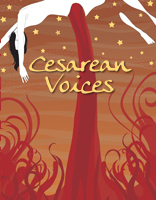 This groundbreaking book answers the question “What’s so bad about a cesarean?” in a raw, honest, heart-shattering way. If you care for or about women and babies, hear these voices. The International Cesarean Awareness Network is a non-profit organization whose mission is to improve maternal-child health by reducing preventable cesareans through education, supporting cesarean recovery, and advocating for vaginal birth after cesarean (VBAC).